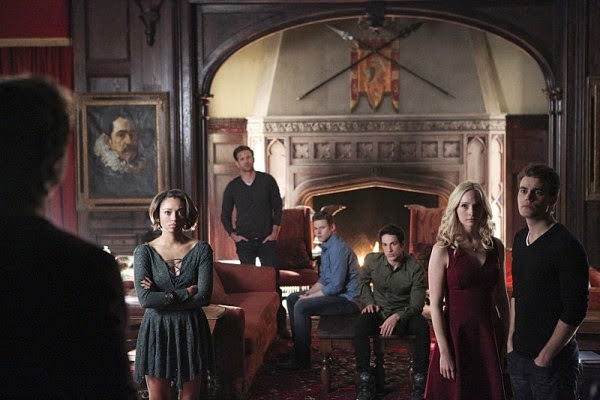 Thoughts on The Vampire Diaries Season 6 Episode 22 "I'm Thinking of You All the While" .. SEASON 6 FINALE! Not exactly sure about how to feel about the Season 6 finale of The Vampire Diaries. I actually am probably going to make an alternate ending myself on Youtube when I find the time and maybe I will even do a whole other complete alternate universe because I honestly was not satisfied with what happened. I know some of you may disagree, but some of you may also agree as well..
Kai killed Jo and the twins at the wedding. He also killed himself causing the entire Gemini Coven to die since he was the leader. However he did injest some of Lily Salvatore's blood... So he became a vampire. Damon ran Elena to the hospital only to find out that she was in perfect condition. Apparently, Kai linked Elena to Bonnie... saying that only one of them can live. Either Bonnie had to die and Elena would awaken or Elena would stay in a deep sleep and Bonnie could live. Alaric attempted to commit suicide and attempted to kill Kai with a shot gun, but he had already turned into a vampire. Tyler triggered his werewolf curse by killing his love, Liv, since she was already going to die and he was in the process of dying on a full moon. Tyler ends up biting Kai, but unfortunately Kai absorbs the werewolf bite. Bonnie and Kai fought, but it was not that epic AT ALL. Kai ends up almost killing Bonnie with a simple thrash against the wall. Bonnie's lungs started caving in and Damon shows up to tell Bonnie he chooses Elena over her. Kai is pretty disoriented about it because he wanted Damon to suffer a bit more. He thought Damon was going to attempt to help Bonnie... and then all of a sudden Damon slices Kai's head off swiftly and rescues a dying Bonnie with his blood. She was shocked to see that he came back for her because she thought he actually left her. Stefan tells Caroline that he'd wait for her and that he was in love with her. He said she could take all the time she needed for her. Stefan also says that Elena brought him and Damon closer. He stated that Elena brought the good out of Damon and made Stefan believe in Damon's goodness. He came to the conclusion that he needed Damon more than he needed Elena. Elena stayed in a suspended state and all of the loved one came to see her off. She told Caroline to take care of everyone. She told Bonnie that she's been sacrificing for her all this time and it was her turn to sacrifice for Bonnie and let her live. She told Tyler to embrace being a werewolf and leave Mystic Falls. She saw Matt as a police officer and told him that he needed to be protecting people like him. She expressed to Alaric to let all the pain in and overcome it to be happy. Jeremy showed up as well and told her he would be happy doing what he loved to do. She told Stefan that she couldn't wait to see what kind of life he made for himself. And lastly with Damon...she told him to live his life instead of simply waiting for her for the next 60 years. They danced together and shared a passionate kiss. Bonnie is suppose to spell Elena's body which is in a casket in the tomb to keep her safe until she wakes up 60 years+ later. 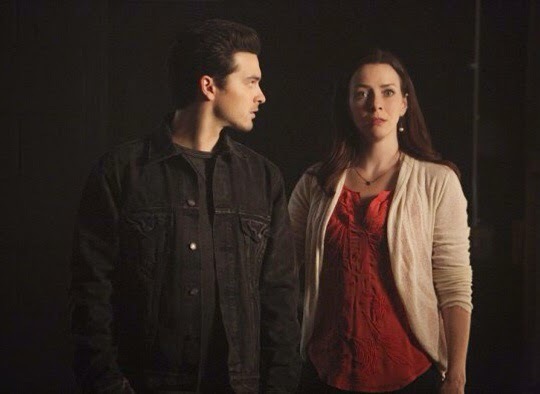 Lily Salvatore was finally reunited with her Heretic loved ones with Enzo. The last scene flash forwards to Mystic Falls looking like it has been through some sort of destruction as Matt drives through in his police car and Damon overlooks the city on a clock tower. Thoughts on The Vampire Diaries Season 6 Episode 22 FINALE! Bonnie and Kai's epic fight was horrible and it wasn't what I was waiting for. I was waiting for something way more than what I saw and I was disappointed. Also.... ARE YOU TELLING ME THAT ALL THESE PEOPLE NEEDED TO DO TO KILL A VAMPIRE WAS SLICE THEIR HEAD OFF? That action alone from Damon just made me feel like every fight in the history of TVD could have been executed without such hassle. Kai honestly should not have been that easy to kill to be completely honest. I was hoping he'd be back for next season. I thought Elena was going to die, but I feel like they created this as a way for Nina Dobrev to come back if she wanted to in the future. Not sure how I feel about the Steroline relationship. I don't know. Something about it has me feeling off. I'm proud of Damon's choice to save Bonnie because my heart started shattering when it seemed like he was about to leave her there to die and Bonnie shed that tear of lost hope. Alaric can't catch a break. I thought he was about to be happy, but nope. I was happy to see Jeremy... of course I was kind of hoping to see a Beremy (Bonnie + Jeremy) reunion. Where was Sarah Salvatore? Did they just write her off? What did Enzo do with her? I did cry a bit as Elena said her goodbyes.....mainly the goodbye to Damon, Matt, Bonnie, Alaric, and Jermey tore me up. So I am excited to see what's going to happen with the vampire witch situation. I am kind of hoping that one of these people is related to Bonnie to some extent. But as for the entire episode... I don't know. Like I said, I think I'm going to create a fan fic /parody season finale for this season of TVD, in addition to some TVD parody videos just because I've been planning on doing it for a while. I also want to say that I wish the writers would not build the villains up to be so big and bad only to annihilate them so easily. They did this with Silas, Markos, and Kai. The only villains on this show that I think were delivered correctly was Katherine and Klaus....and Klaus has his own show now. Actually The Originals maybe better when it comes to actual plot depth. I just hope they don't build the Heretic vampire witches up only to have them destroyed in a simple manner. Tell me what you guys thought about the Season 6 finale of The Vampire Diaries. How did you feel about Elena/Nina leaving the show?